Buttery and sweet, pine nuts are a staple of Italian cooking, and not just because they're a crucial element in the making of a good pesto. 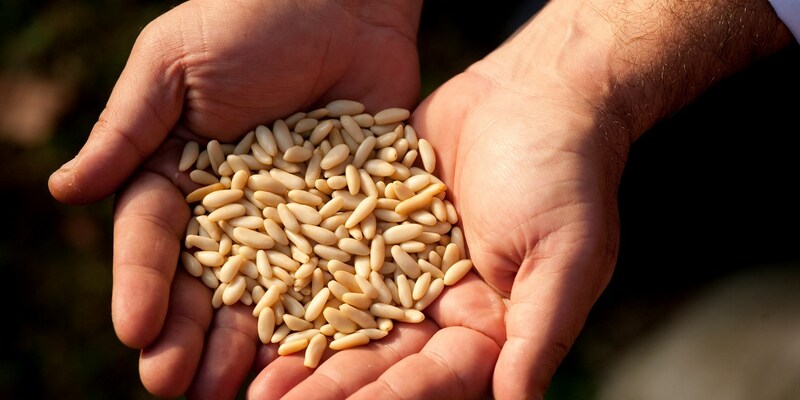 All in all, pine nuts have a rounded and adaptable flavour, and they make a wonderful garnish for meat, fish, salad and vegetable dishes, as you'll see from our collection of pine nut recipes. Manuela Zangara's Pasta alla Genovese is a fantastic place to start if you're looking for a rustic pesto dish that stays true to it's roots, as is Sally Abé's Red pesto. If you're looking for something more adventurous, try the Costardi brothers' spellbinding Asparagus risotto, or a delicious Torta della nonna from Valeria Necchio, who uses pine nuts as a sweet, crunchy cake topping. Pine nuts are delicious on their own, but it's always worth toasting them if you have the time. A bit of gentle heat will coax the aromatic oils to the surface, giving you a nicer colour, texture and flavour.